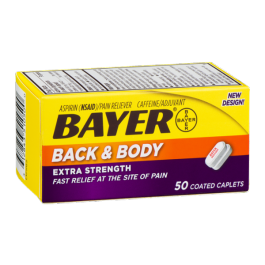 Bayer Aspirin Back & Body Extra Strength. Made from imported materials. Use for the temporary relief of backache pain, muscle aches and pains, minor aches and pains of arthritis. Drink A Full Glass Of Water With Each Dose. Adults And Children 12 Years And Over: Take 2 Caplets Every 6 Hours Not To Exceed 8 Caplets In 24 Hours. Children Under 12 Years: Consult A Doctor. Other: Save Carton For Full Directions And Warnings, Store At Room Temperature. Active (In Each Caplet): Aspirin 500 Mg - Pain Reliever, Caffeine 32.5 Mg - Pain Reliever Aid. Inactive: Carnauba Wax, Corn Starch, D&C Red;30 Aluminum Lake, D&C Yellow;10 Aluminum Lake, Hypromellose, Powdered Cellulose, Propylene Glycol, Shellac, Titanium Dioxide, Triacetin.